Rhonda Dahl with Bell State Bank wanted to do something special with her Bell State Bank Community Connect Pay it Forward check. Prompted by an article in the Forum of Fargo-Moorhead about Becky Wood, her hair stylist and Hospice of the Red River Valley volunteer, Rhonda decided to present her check to Becky who had shared with Rhonda how rewarding her time spent providing haircuts to Hospice patients has been to her. Rhonda knew Becky would be the perfect recipient because of her passion for helping others, kind-hearted nature and commitment to volunteering in the community. 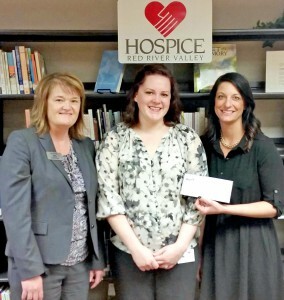 Becky presented the Pay it Forward check for $1,000 to Hospice of the Red River Valley Coordinator Megan Schroeder. Thank you to Rhonda, Becky and Bell State Bank!